The black text is the question paper. The blue text is the actual listening. Follow the orange signals to find your place e.g. Good morning everyone. Now whether you’re going to university to study business or some other subject, many of you will eventually end up working for a company of some kind. Now, when you first start working somewhere you will realise that the organisation you’ve joined has certain characteristics. And we often refer to these social characteristics as the culture of the organisation – this includes its unwritten ideas, beliefs, values and things like that. One well known writer has classified company cultures by identifying four major types. The first type is called the Power Culture, and it’s usually found in small organisations. 31. It’s the type of culture that needs a central source of power to be effective, and because control is in the hands of just one or two people there aren’t many rules or procedures. 32. Another characteristic is that communication usually takes the form of conversations rather than, say, formal meetings or written memos. Now one of the benefits of this culture is that the organisation has the ability to act quickly, so it responds well to threat, or danger on the one hand, and opportunity on the other. 33. But on the negative side, this type of organisation doesn’t always act effectively, because it depends too much on one or two people at the top, and when these people make poor decisions there’s no-one else who can influence them. 34. And the kind of person who does well in this type of business culture is one who is happy to take risks, and for whom job security is a low priority. The next type is known as Role Culture – that’s R-O-L-E, not R-O-double L, by the way. 35. This type is usually found in large companies, which have lots of different levels in them. These organisations usually have separate departments that specialise in things like finance, or sales, or maintenance, or whatever. 36. Each one is co-ordinated at the top by a small group of senior managers, and typically everyone’s job is controlled by sets of rules and procedures-for example, there are specific job descriptions, rules for discipline, and so on. What are the benefits of this kind of culture? Well firstly, because it’s found in large organisations, its fixed costs, or overheads as they’re known, are low in relation to its output, or what it produces. In other words it can achieve economies of scale. 38. On the other hand, this culture is often very slow to recognise the need for change, and even slower to react. 39. What kind of person does this type of culture suit? Well it suits employees who value security, and who don’t particularly want to have responsibility. Moving on now to Task Cultures – this type is found in organisations that are project-oriented. You usually find it where the market for the company’s product is extremely competitive or where the projects themselves have a short life-span. Usually top management delegates the projects, the people and other resources. And once these have been allocated, little day-to-day-control is exercised from the top, because this would seem like ‘breaking the rules’. 40. Now one of the major benefits of this culture is that it’s flexible. 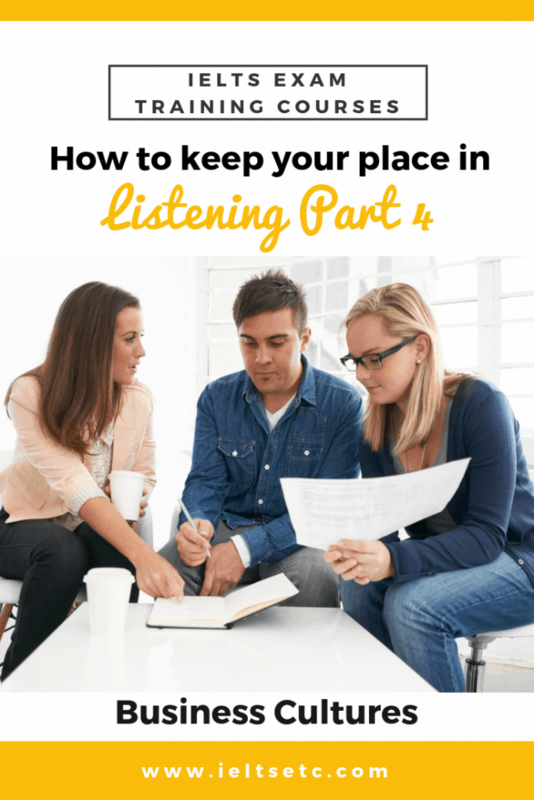 Get lots more practise with Listening here. To get the actual Listening test and worksheet and a Listening, Speaking and Pronunciation course, come and join us in the Members Academy. In the Members Academy, you’ll find everything you need in one place. I choose and write all the materials, so I know you’ll get exactly what you need to prepare efficiently and effectively. You also get access to me when you need help.